Product prices and availability are accurate as of 2019-04-22 08:43:02 EDT and are subject to change. Any price and availability information displayed on http://www.amazon.com/ at the time of purchase will apply to the purchase of this product. Wireless Keyless Entry. Compatible with ALL MVP garage door openers. 10 button alphanumeric keypad. User selects a 4 digit PIN number. Back lit keypad. Easy mounting (Battery, Mounting Screws and Instructions Included). 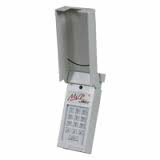 Dimensions 6" x 2 1/2" x 1 1/4"
Wireless Kelyless Entry compatible with ALL MVP garage door openers. 10 button alphanumeric keypad. Users selects a four digit PIN. Easy mounting (Battery, Mounting Screws and Instructions Included). Dimensions 6" x 2 1/2" x 1 1/4 inch.